DATE OF EVENT Held every Sunday. See our Main Calendar for details. TIME Salsa goes from approximately 9:30 PM to 2:00 AM in the main front room. The period from 9:00 - 9:30 PM is somewhat of a mix of bachata & salsa. After 9:30 PM, it's mostly salsa. On occasional dates around holidays, there are extended hours, usually to 4:00 AM. See our Main Calendar for details. Before this salsa social, from 5:00 - 9:00 PM, there is a mostly bachata social. The period from 9:00 - 9:30 PM is somewhat of a mix of bachata & salsa. Time is different during special events. See our Main Calendar for details. There are also separate rooms in the back for different kinds of dancing depending on the night, for example there could be bachata, west coast swing, zouk, kizomba and hip hop going on in several different rooms simultaneously. DanceSport Studios, 22 West 34th Street (between 5th & 6th Avenues), 4th floor, midtown Manhattan, New York City. East entrance. Studio phone - 212-307-1111. PRESENTED BY DJ Alejandro Bouza. CONTACT INFO DJ Alejandro Bouza - phone 917-684-8584 - email AleBouza@gmail.com - web sites www.AlejandroBouza.com and www.LatinParty.com . TYPE OF EVENT & VENUE The official after party for both the Jimmy Anton Social and the LVG La Vieja Guardia Social. This is a salsa social held in a very large dance studio with excellent wooden dance floor, mirror walls, state of the art sound system This recently renovated very attractive dance studio is fixed up like a club with an adjoining cafe with full bar and assorted snacks. MUSIC Classic and some contemporary "pop" salsa plus a little cha cha, bachata & merengue. DANCE PERFORMANCES Sometimes. The would be listed on our Main Calendar. DJ DJ Alejandro Bouza plays wide range of salsa music. DANCE FLOOR Large beautifully finished wooden ballroom dance floor which is "medium speed". PRICES Before 5:15 PM, it's usually $7 admission. After 5:15 PM, it's usually $13 before 10:00 PM and $15 after 10:00 PM. Prices may change. If you come from the Jimmy Anton Social with an armband, admission is $7 between 10:00 - 11:00 PM. On special nights, such as with many performances or a band or "performance challenge", higher pricing may apply, such as $20 before 10:00 PM. Check with promoter for exact pricing for a particular night. All night specials on various beverages. There will be wraps and empanadas at 9:00 PM while supplies last. 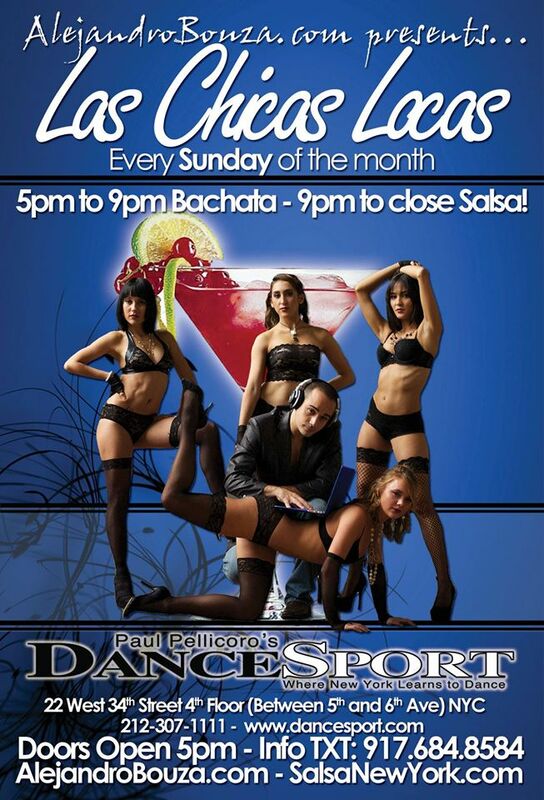 After 9:00 PM, the party will be mainly salsa and most of the dancers will be On 2. Before 9:00 PM is mainly a bachata social. DESCRIPTION This event was originally started by DJ Alejandro Bouza and held at the Four Points Sheraton a while ago. Now it is at DanceSport Studios in a nicely equipped dance studio with a good wooden ballroom floor. There is usually a good size crowd of On 2 dancers at different levels after around 9:30 PM, so there would be partners to dance with. As it gets later, especially after the performances, more advanced dancers come. And it is a very friendly crowd which is welcoming to newcomers. Drink prices for the "specials" are reasonable. This is where the salseros go to continue dancing after the usual Sunday evening socials. There are also separate rooms for tango, west coast swing, zouk and kizomba going on at the same time. HOW TO GET THERE This event is being held at DanceSport , 22 West 34th Street (between 5th and 6th Avenues), 4th floor, East Entrance, in the midtown area of Manhattan, New York City. Studio phone 212-307-1111. To see a map showing the exact location, Click Here For Map. Public transportation: The closest subways would be the B, D, F, N, Q, R, V, W trains to the 34th Street-Penn Station subway station. There are also busses across 34th Street and up and down 5th Avenue, 6th Avenue and Broadway. For more information on public transportation, click on NYC Subway-Bus-Train Maps , or NY-NJ PATH Train Maps or Long Island Railroad Maps or MetroNorth Railroad Maps . There is street parking nearby but you will probably have to drive around looking for a while. There is a mostly bachata social from 6:00 - 9:00 PM.